Green Turtles, specimens of which weigh up to 300 pounds, used to inhabit the Atlantic Ocean from southern Canada south to Argentina. The Pacific Green Turtle belongs to a different species. The Green Turtle used to be an important food resource of the people inhabiting shores and islands of the Atlantic coast. The flesh is delicious, the shell forms the basis for a soup, and the eggs are a staple item in many Latin American countries. 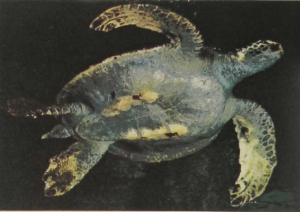 Green Turtles feed on marine algae and migrate from great distances in a pattern that is only now being studied by marking specimens as they come to nest on the breeding beaches of Central America and trailing animals taken in other areas. If the animals were protected on the breeding sites and allowed to recover from the wholesale hunting to which they have been exposed, they could continue to provide an imoortant food resource for tropical areas.